Show and Sell your one of a kind Bears, Dolls or Critters simply and easily. Applications for our next show "Rainbow or Regular" are now open. 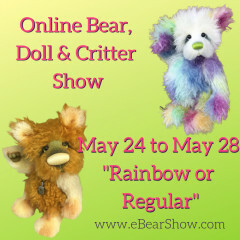 Starting Friday May 24th 2019 at 4:00 PM we will be bringing together some of the World's most talented bear, doll and critter artists in a unique online show. If you are a maker of original Bears, Dolls or Critters then you need to have your creations on show. It's free to create a Stall so hit the button below to get started now. Congratulations to the winners from our previous show "Sculptured or Simplified"
So, how is eBearShow.com different? Your time is best spent working on your creations, not making websites, so we’ve taken that bit away. Simply upload your images, fill in your description, add any shipping and our site will make a professional looking stall just for you. When your listing is sold, PayPal notifies our site automatically so the item is marked off as sold. No more trying to stay awake for the whole weekend to mark off sales. You don’t even need to make the paypal buttons yourself, our site does it for you. Mobile traffic is booming so we’ve also made sure your page works perfectly on mobile devices like phones and tablets. It will automatically resize your stall and your images to fit the device perfectly without any additional work from you. If after all that you still need some help, we are only too happy to provide it. We’ve made it our mission to give you more time to spend creating your art. Here's just a few of the Artists who have entered our shows. Isn't it time you had your creations on show too? Set up your stall for free.